Their hard drives didn’t crash and they didn’t allow access to questionable material. Just two of the traits of the old-fashioned typewriter, now long gone by the wayside in favor of flashy computer screens and a snazzy world of word-processing shortcuts and graphics-oriented text. A younger generation that has never heard the click-clack of a well-oiled Smith Corona — not even the electric variety — can now be exposed to the technology that put the written word to paper for generations. And more than a few adults will have their memories rekindled by reminiscing about the reliable machines of the past. 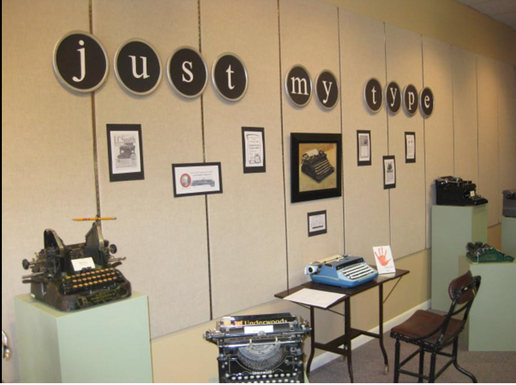 The Dekker-Huis/Zeeland Historical Museum’s latest exhibit, “Just My Type,” showcases several vintage manual typewriters from the museum’s storage that were dusted off and cleaned up. Those involved in the restoration and display set-up included members of the Zeeland Historical Society’s Junior Volunteers, an emerging program that puts the community’s youth in touch with the area’s past. The Dekker-Huis/Zeeland Historical Museum is open on Saturdays from 10 a.m.-2 p.m.
“This is the first gallery show where our team of junior volunteers, Colin and Ivan Christopher and Kaleigh Kirkland, helped out,” said museum curator Suzy Frederick. “All three showed a flair for good design sense and enjoyed the challenge. “We change out the gallery shows two to three times yearly,” Frederick said. Frederick said her role is to keep inventory of not only the items on display, but everything in storage. The new gallery takes visitors back to the days when the writer endured the constant sound of click, clack, ca-chung, no spell-checker and no cut and paste. One of the oldest models on display is an Oliver No. 9 made between 1916-1922. It features a unique u-shape type bar and curious “ears” on the side for handles. Mickey Spillane, American author of crime novels many featuring the detective Mike Hammer, favored the L.C. Smith No. 8. Andy Rooney of “60 Minutes” fame died at the age of 92 never owning a computer. All his scripts for radio and television and books came from a 1922 Underwood No. 5. Noel Coward, the English playwright, composer, director, actor and singer preferred the Royal KHM. 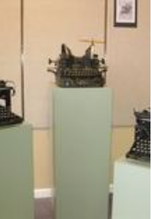 A 1940s Smith Corona is part of the children’s “Hands On” program at the museum. “It has become quite a curiosity with our younger visitors,” Frederick said. “This is the only model children can actually sit down and type on when they visit. It has been a real hit. Children gravitate right to it when they come into the gallery. “We encourage all to come in and enjoy seeing all these old relics exhibited on new display pedestals constructed and generously donated by Tony Huver and his crew at Zeeland Lumber,” Frederick said. Despite being a child of the computer age, Junior Volunteer Colin Christopher, 14, became intrigued by the typewriters. He and Frederick spent hours cleaning the units and searching for background information on the Internet. Colin said the typewriters were in good condition, with one even maintaining a bright shine. “It’s something how some of them have endured all of these years,” he said. Colin’s 16-year-old brother Ivan also helped out with the project, including helping Frederick set up the display. He also enjoys being a part of the Junior Volunteer program. As far as working with the dinosaur of documenting the written word, Ivan has become a fan. The Christopher boys’ mother Mary sees benefits for having her children be involved in the museum’s activities. The family relocated to Zeeland from South Carolina two years ago. “Our Junior Volunteer program is rather new, it is under the supervision of Debbie Albert who is our children’s activities director,” Frederick said. In the past she has coordinated teas, Pioneer Days, Pumpkinfest family fun, visit with Sinterklaas and much more. • Dekker-Huis/Zeeland Historical Museum, 37 E. Main Ave.